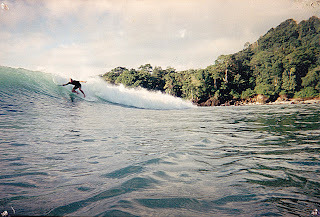 Dreaming of surf trips in the near future makes me look back to trips long past, a few faded old polaroid pictures of some good times deep in the Central American jungle. These were the days when a trip to Centro America was an adventure. took 8 hours to get anywhere and the possibility of losing the 4x4 rental car in a river was a 1 in 4 chance. Worth it? Hell Yeah! (photo) Jaco Beach Costa Rica back when Jaco was still a cow pasture... Me sliding down a fun easy left with my buddy Shawn taking a shot with a disposable water camera. The cross A's in the pic was my old surfboard label. Yeah, I rode shortboards once upon a time. This is probably the most beautiful right point I have ever seen. Its called Back Wash Bay. Right after this pic of me taking off the wave gets hit by the back wash from the steep beach and goes from a friendly head high to double over head, you really have to be ready or you will get launched 20ft in the air. Oh yeah the very sharp rock lava flow is just a few feet under my board. But what a fun wave, Scarlet macaws in the trees on the beach, Monkeys and the occasional jaguar. You cross 3 rivers to get to this wave and nearest powerline and town was hours away. (Photo) The cantina on one of the longest lefts in the world, Pavones. This was a good trip, the take off was 20+ foot on the face for 2 weeks straight. Pretty sick. Even though I am a regular footer, I don't care- this wave kicks azz. (Photo) Now this is a secret left poimt and probably the most magical wave I have ever riden. It breaks well over a mile ride one start to finish and you won't see your friends for a hour and the walk back up the point to the paddle out area is over 2000 steps for me. I counted once. Oh yeah these pics were taken probably 18+ years ago, I was a much younger then 20 something. Can you guys see the possibilities on a Standup? My new printer scanner thing is pretty sweet I will be putting up more pics in time. Yes!!! Sweet post Capt. Ron- endless, endless, endless possibilities in central Am., especially southern Costa- my favorite left in the world!!!! I've been down there four or five times all over the country- when I go down now, I go directly to Pavones... to me, it's the best part of the country. Can't wait to see more photos! Okay- you got me- I'm going to have to find out where that "secret left" is.... I'll make it worth your while. We don't need to discuss it here... we'll figure it out soon enough. When you come down out of teh mountain on the way to Pavones and the road or umm goat trail makes a hard left turn and goes along the beach you already went to far. "Punta Pilone" I say on a good day 2x longer than Pavones and 15 sec of thin lipped barrel into 15-20 second hot dog section then back in the barrel and more makeable than Pavones and less crowded. Unreal wave. I remember back in the late 90's I was in Jaco and showed some Cali boys to the Las Pilas water fall it was a real misreable muddy walk. That wasn't you and your buddies was it? 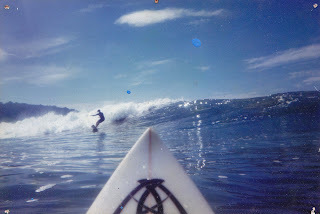 Oh yeah John you know how fast Pavones is takes only a minute or less to ride from up above the river to the boat bay or Salia, well Pilone on a good over head day takes 3-4 minutes to ride the length and 30 minutes to walk back to the paddle out spot. Ever catch Boca Barranca 12ft before John. I have a dozen times or so breaks off Dona Anna and rides last almost 5 minutes when its that big, but its still realy friedly. I like that wave to but there are some big crocs in the lineup sometimes. Hey John, Spider and I both know where the secret is. Wally isn't M.I.A. just been busy with family takin care of business ya know! I'm getting stoked for the trip and really am looking forward to shooting tons of pix! Have fun in "Ztown" and we gotta get the 10-22mm in the water when you get back and give it a test run!! Nope not me in Jaco- the only time I stopped there we got ripped off at Hermosa when we parked under the tree and went for a surf. Never again- I head straight south. Dude- I'm going to Costa with you next time... sounds like you know your way around... let's pull a full stando attack on the place! Knox Bros: You guys are so clued in that it's scary... friends around the world and all that... you must be good people (yep, you are)! Wally: Hey Brotha- we'll definitely hook up and get you all squared away for this winter's trip... gonna be a good one! Can't wait to see the wide angle... did you get a new port for the housing?